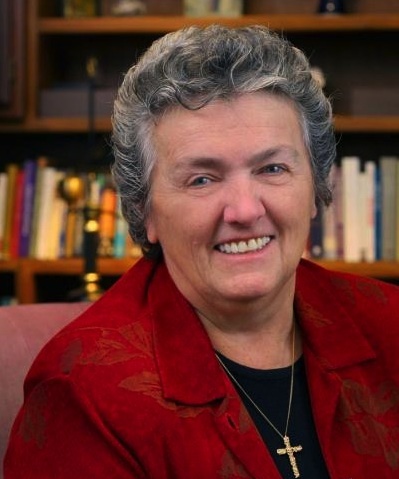 Sister Joan D. Chittister, O.S.B. is a Benedictine nun, speaker and writer. She is a member of the Benedictine Sisters of Erie, Penn., where she has served as prioress. Focusing on feminist spirituality and social issues, her web column “From Where I Stand” appears weekly in the National Catholic Reporter. Sister Chittister holds an M.A. from the University of Notre Dame and a Ph.D. in speech communication theory from Penn State University. She is the founder of Benetvision and co-chair of the UN-sponsored Global Peace Initiative of Women. On Aug. 10, Orbis Books published a collection of her works under the title of “Joan Chittister: Essential Writings.” On Sept. 2, I interviewed Sister Chittister by email about her work on behalf of faith and justice. Orbis Books has published a topical selection of your “Essential Writings” in a nice paperback edition. How do you feel about that? Great question. I just wish you hadn’t asked it! It was a very sobering moment. It was also an overwhelming one. The ancients said, “Sola scriptura manet”—Only the written word remains. To see this collection bound made me very conscious of what it means to be a writer. It is a deeply spiritual responsibility. I would like some day to be worthy of that. Looking at the writings in this collection, what themes do you feel stand out as the most important in your long career as a writer and speaker? Frankly, I think that the editors got it just right. When I see it in print, I know that these two editors, Sr. Mary Lou Kownacki and Dr. Mary Hembrow Snyder, read the heart of the material as well as the content. For me, it’s all been about the search for God and the renewal of religious life, justice for all and the joy of living. Their very precise choice of materials makes those themes startlingly clear. How are things going at Benetvision, your online media ministry? Well, we’re a very small team. We have a part-time editorial staff of five sisters and a support staff of four to design and anchor “Monasteries of the Heart. org,”our new monastery without walls. So we can’t do everything we’d like to do. But we have on-line prayer and contemplation modules, on-line courses in Benedictine Spirituality, retreat offerings, book discussions, and the formation of on-site and online communities—all of them lay-led. I have never seen a team with more spirit and so much commitment. The desire to provide an on-line spiritual home for people who are seeking both deep personal spirituality and communal support in these transitional times impels us all. Benedictine spirituality has made profound contributions to every century. We are intent on being part of what makes that happen in this century, as well. And through our new model of online community called “Monasteries of the Heart” we’re seeing a great deal of very positive response. In a little over a year we had more than 10,000 registered members who participate in the offerings there from time to time and almost 3,000 who visit the site every day. Is the Global Peace Initiative of Women making any progress right now? GPIW is a very wide-ranging network of local religious leaders who cross the barriers created by politics, national borders, ethnic differences and even religion. Dena Merriam, our founder and convener, in fact, just received the $200,000 Niwano Peace Prize for these efforts. GPIW is a woman led, citizen-driven attempt to bring the message that none of the great religious traditions can possibly justify what is happening to the poorest of the poor—women, children—in this war-ravaged world right now. We expect to be in Iran next. Are we making “progress?”It depends on what you call “progress.”I call it witnessing to the truth—even when evil seems to prevail. You’ve written a lot about peace, but there seems to be more violence in the world today than ever before. What is the biggest threat to world peace today? In a word, poverty. It seems to me that the whole world is going through the French Revolution again. Every society and level of society in the world is looking for liberty, equality and human community now, too. So, it’s about the distribution of basic resources. When we do that we will have the sharing of power and the equal status of all human beings. Nothing will change until governments everywhere devote themselves to those ideas. Including our own. You know, reform starts at home. And if it does not, then the world is ripe for extremism, just as it was once ripe for demagogues and dictators. What are some signs of hope around the world today? The signs of hope are everywhere. It’s just a matter of organizing them. First, we have the technical means now to hear the cries of the world around us. Which means that we must be seen responding to those cries if we really believe that they have the right to the same resources and so the same human dignityas ourselves. Secondly, we have leadership for a new kind of world emerging at every level of society and coming from every discipline and culture—which, for the first time in history, enables us to approach every problem with balance. Third, we’ve never had more open discussion of the challenges faced by the human race or more people in every arena pursuing answers to them. Finally, the old centers of power, both political and corporate, are under great pressure to operate with “liberty, equality and justice for all”or be toppled. Point: The question is not do we have the means to resolve the human problems we face in the global village. The question now is, do we or do we not have the political will to do so before it is too late. Of course, we won’t have this will until we really believe that all people are equal and worthy of a decent and dignified life. Peace can never be imposed; it can only be something we all believe in enough to provide what it will take to achieve it. What’s your biggest social justice concern at this moment? I am very concerned about the movement toward extremism everywhere, including in our own country. When you have a Congress itself that is dedicated to polarization, when political grid lock becomes a government strategy, you are sowing the seeds of social destruction. The government is eating its own tail so what can anyone else do to create workable answers. Conservatism and liberalism are each long-lived and valuable philosophical approaches to social questions. But we aren’t learning anything now, either from our past or from one another. We don’t have a well thought out, reflective and —most important of all—self-critical philosophical approach to anything anymore. We have only “conservatives”and “liberals”—labels without a license—who take opposite sides on every issue and refuse to talk to one another about them. So, we have politicians refusing to work together to determine what is good for the country. Instead we have infantile competition aimed at winning whatever is the current political derby in order to get total control. There is a genuine difference between those two approaches. Your spirituality has been described as feminist and Benedictine. In what ways are these things true? Both perspectives are very true for me. By ‘feminist,’ I mean anyone, of either gender, who believes in dignity, justice and equality for all people—especially women, gays, the aged, the challenged, the economically disadvantaged—and is committed to doing whatever is necessary to make that happen. Furthermore, I believe that this is mandated by the model of Jesus in the Gospels. My question is not whether a person can be a Christian and be a feminist. My question is how can a person possibly be a Christian and not be a feminist. As a Benedictine, I believe that the spirituality and the life-style defined in the Rule of Benedict is a living icon of that feminist commitment. Among other things, Benedict requires that all members in his monastery—nobles and peasants and slaves alike—live on an even footing with equal responsibility and rights in its decision-making process. He discourages the admission of priests to the community in order to make sure that clericalism does not overtake the spiritual value of a lay community. He makes humility the cornerstone of his spirituality and requires it for Roman men, a visible counter-sign to the status of males in the society around him. He makes everyone in the monastery both a student and a laborer, a total confrontation with the classist society in which his monasteries emerged. Through the years a lot of this consciousness may have eroded, yes, but it is the heart and nature of Benedictine spirituality. Consequently, I live very comfortably with both, one perspective and spirituality confirming the other. And I am totally committed to both, as well. Who are the people, living or dead, who inspire you the most right now? Oh, this is the most difficult question of them all. There are simply so many great people whose lives have touched mine. As far as I’m concerned,we live in a century of great people—holy people—who have given their lives for others or articulated the best of the Gospel so that the rest of us did not lose sight of the reason we were born. Dorothy Day, Archbishop Oscar Romero, Thomas Merton, Martin Luther King, Jr., Hildegarde of Bingen, Therese of Avila, Catherine of Siena, Sr. Mary Luke Tobin, SL, among others, have all touched my heart in very special ways. In today’s environment, I have special admiration for Bishop Thomas Gumbleton, who has been bishop to the poor and marginalized forever and Roy Bourgois, Maryknoll priest, whose commitment to justice at all levels is straight out of scripture and for which each has paid too high a price from the very church that modeled those ideas for them. I also have great respect for Sr. Elizabeth Johnson and Sr. Patricia Farrell and the sisters of the LCWR. I have seen them all give their lives to the advancement of women, the rights of the poor and the renewal of the church and religious life. That is a gift of immeasurable value to the whole people of God. What do you hope people will take away from your writings and ministry? That the purpose of our lives is to live as witnesses to the Will of God for all of creation. That all holiness and all human success lies in that and that alone. I think the church has needed a smiling face and a sense of the servant church for a long, long time. I can only hope that someone so devoted to the cause of the poor also realizes that women are the poorest of the poor everywhere. And do something loud, bold and continuous to call attention to the diminished status, security and economic equality of women in order to change that. There are some things he does need to “judge”and one of them is the place of women in the church and the world. A holy church, a country worthy of its ideals, and equality for all the women of the world who live in slavery, poverty, second-classism and oppression everywhere. Only gratitude for your interest in these things and the quality of thought and Catholic journalism that America Magazine provides for us all. When my husband and were first married and had moved into our new house, we were unpacking my boxes and boxes of books and organizing them on the shelf. He pulled out a book by Sr. Chittister and exclaimed "You have this book! I read this in college. This book changed my life." When I read that she hopes that what she wants us to get out of her writing is that "The purpose of our lives is to live as witnesses to the Will of God for all of creation..." I think of my husband, who is now an assistant principal at a Catholic elementary school and devoted to being this witness to his students. I had the good fortune to stay across the hall from Sister at last year's AAR convention; we rode up the elevator after the Pope Francis panel and I was so excited to thank her in person for her writing and let her know how meaningful her work had been to my husband and me. I was about 7 months pregnant with my second daughter at the time and got a belly pat and a blessing. I was deeply moved by her warmth and generous openness to the worth of all persons, which I think comes across beautifully in this interview. Thank you Father Salai for this interview. I, along with friends, am reading Sr Chittister's book "The Gift of Years" and we are grateful for her insights.